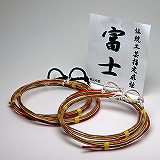 Please indicate Nami-sun or 2 sun nobi and bow strength (kg) for your hemp string order. * Hemp strings are used for bamboo bows. If there's the size of hemp strings you are unclear on, please let us know your bamboo bow strength in kg.